This page provides instructions on how to update the firmware for Personal Audio System SRS-X77 to version 1.60.2994. Maintenance for Chromecast built-in will be performed automatically when your network connection is available. Modify the issue which no display “Update audio system” on the screen of SongPal. Adds support for Spotify music service. Improve the operation of selecting copyright protected contents while playing in DLNA mode. There are two methods, please click the link below for instructions. IMPORTANT: It is not possible to roll back to previous firmware version once you updated to latest version. Note: If the version is displayed as 1.60.2994, you do not need to update the firmware. Connect the AC power cord (supplied) to the AC adaptor (supplied). Press the button to turn the power on. 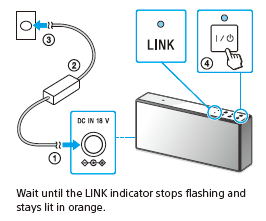 Wait until the LINK indicator stops flashing and stays lit in orange. To perform Software Update via internet. Please check the following steps. Wait until the LINK indicator stops flashing and stays lit in pink or orange. If software update fails during network update, please update the firmware according to the symptoms listed below by using a USB flash drive. The Software update is NOT completed, but the Speaker is in normal condition. To complete the software update, update the software with a USB flash drive by using Method 1 of the update instructions here. The Software update has FAIL, all operations and functions cannot be used except for the power button. To complete the software update, update the software with a USB flash drive by using Method 2 of the update instructions here. When unit starts the updating process, the update button will begin to flash 4 times, depending on the progress, number of flashing will be reduced gradually to one flash and unit will switch to standby mode. This indicates the unit has been updated successfully. If the flashing shows differently during the process, please refer to some of the flashing condition as stated above. The version can be found on the System Software Version in Device Details Menu. If the version is displayed as 1.60.2994, the software upgrade was successful. Note: Operation is not guaranteed for all USB flash drive. Before downloading the firmware, please ensure that your computer is running one of the supported operating systems and prepare a USB flash drive. Note: This is the dedicated update file for SRS-X77 only. You cannot use this file with other Personal Audio System. The SRSX77V1602994 folder is now open on your computer's desktop. UPDATE files are 4 files of “LUTE03-FW.BIN”、“LUTE03-FW.ID”、“LUTE03-FW_MB.BIN”、“LUTE03-FW_MB.ID”in extracted folder, “UPDATE”. The SRSX77V1602994 folder is created on your desktop. Note: Initialized the USB flash drive by the original manufacturer system. Copy the UPDATE folder inside it to the USB flash drive. Refer to the below diagram. Connect the AC adaptor (supplied) to the DC IN 18 V jack of the speaker. Plug the AC power cord connected to the AC adaptor into an AC outlet securely. 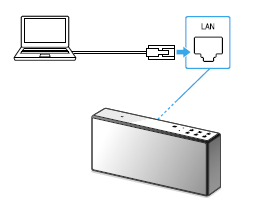 Set the NETWORK OFF/ON switch on rear side to ON. Push(Tap) the (on/standby) button, then turning power on. Wait for approximately 4 minutes, after which the LINK indictor will then blink slowly. Tap and hold the AUDIO IN button and Volume-button. The UPDATE button lights up after beeps are heard. Note: If you are connected to the network, the UPDATE button is lit in orange. In this case, please perform Step 6 and check the beep sound. Do note, there is no change in the display. While UPDATE button lights up, insert the USB flash drive to DC-OUT ONLY (USB) slot on the speaker rear side. Note: The speaker is not operational while updating. When update has been completed, please check that the version of the speaker that has been updated to 1.60.2994. When the indicator flashes in red and UPDATE button flashes in orange, then press the POWER button to turn OFF the speaker. Insert USB flash drive (included update files) into DC-OUT ONLY (USB) port. Press the button to turn ON the speaker. *Please operate from step4 to step6 within 3 minutes. After a short time, the UPDATE button will start flashing and Software update will start automatically. During the update, the speaker cannot be operated. Number of flashes of the UPDATE button will change accordingly during the progress of the update. When updating is completed, the speaker will switch to standby mode or BLUETOOTH/Network standby mode automatically. The UPDATE button will flash 3 times when the speaker is powered on for the first time. Keep the speaker connected to the power supply while updating. Updating normally takes about 10 minutes.